Exert yourself. Whether conscious or unrecognized, that imperative underlies our everyday experience. Our livelihoods and indeed our survival depend upon our exertions. If we are to compete, achieve, and contribute to the common good, we must exert ourselves. Even the pursuit of happiness, as it is called, requires exertion. No rest for the weary, and no mercy for the slacker. Yet even the highest achievers need their rest. The great pianist Vladimir Horowitz was once asked how he managed to play so many notes so quickly. “I relax between notes,” he cheerfully replied. As Horowitz well understood, rest and relaxation are essential, both before and during performance. They make strenuous exertion possible. Quite often, people in need of rest and relaxation find their way to Zen practice. Viewed from a distance, the practice offers the prospect of unruffled calm. Yet, as newcomers soon find out, it is not always easy to rest or relax, even in a meditative setting. For those accustomed to multi-tasking, hyperconnectivity, and busyness generally, the simple act of stopping and resting can be as challenging as the most demanding activity. Admonished to sit still, the body rebels. A shoulder aches; a knee hurts; a foot wants to fidget. Efforts to correct one’s posture or relieve one’s unease often result only in new forms of discomfort. Wedded to incessant movement, the body wants to do, not merely to be. Likewise, the mind resists immobilization. It craves activity, whether that activity be generating memories and fantasies, forming judgments, discriminating between this and that, or engaging in abstract speculation. “Rest in awareness,” Buddhist teachings advise. “Rest in the openness of mind.” But if we are anticipating a hectic day, or coming off a troubling one, those traditional imperatives can ring rather hollow. 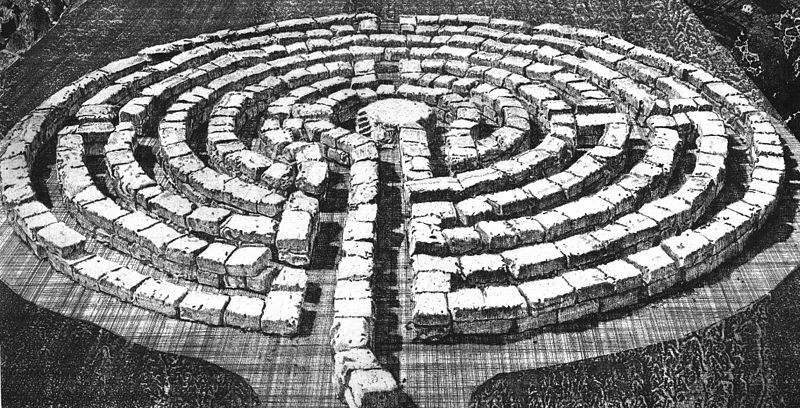 It is as if we were caught in a labyrinth of our own making—a labyrinth, as it were, of unending exertion. Fortunately, a guiding thread may be found in the teachings of Eihei Dogen (1200-1253), founder of the Soto Zen tradition. In his masterwork, Shobogenzo, Dogen Zenji propounds the concept of ippo-gujin (or gujin for short), which means “the full exertion of a single thing.” That may sound like yet another form of striving, but it is actually quite the opposite. Far from adding another burden, the practice offers a path toward total rest. By “obstruction” Cook means those preferences, discriminations, and judgments that reinforce a sense of “me” and keep us from identifying with our present situation. Practicing gujin, we wholeheartedly enter that situation, however attractive or unnerving it may be. We immerse ourselves totally, without, as Cook puts it, “omitting even a fragment of [ourselves] from the act.”* By this means we allow the situation itself to manifest. Framed in this fashion, gujin may seem to require effort, and in its own way, it does. Can we really allow the situations in our lives to manifest themselves? To be as they are, unaltered by our habitual manipulations? Perhaps we can, but our lifelong conditioning militates against it. Truly to practice gujin requires us to bring both wholehearted attention and full acceptance to whatever is occurring, within and around us, at any given moment. And it also requires us to understand that the present moment, however pleasing or upsetting, could not be other than it is, given the causes and conditions that have brought it about. To practice such radical acceptance, as it is sometimes called, requires a kind of exertion, mental and physical, as well as an effort to counter the habits of a lifetime. Paradoxically, however, Dogen’s “total exertion” is also a way of freeing ourselves from compulsive exertion, insofar as our previous exertions have been devoted to filtering, interpreting, or otherwise tampering with our experience. By allowing immediate situations to manifest themselves, just as they are, and by acting in concert with that purpose, we can allow both ourselves and our lives to be fully realized. As Shunryu Suzuki Roshi once put it, we can learn “to observe things as they are, and to let everything go as it goes.”* And along the way, we can afford ourselves some much-needed rest. * Francis Dojun Cook, How to Raise an Ox: Zen Practice as Taught in Master Dogen’s Shobogenzo (Wisdom, 2002), Kindle edition, 43. * Cook, extract from How to Raise an Ox, Wisdom Books website. * Shunryu Suzuki, “Control,” Zen Mind, Beginner’s Mind. Nicely laid out, I have been working on this question for a while now and thanks for not being shy about siting references: the “head bone” is connected to the “sitting bone” after all. Thanks for your comment, Robert. I found Francis Dojun Cook’s book particularly helpful. Zen Master Seung Sahn used to say, “When you do something, do it one hundred percent!” Or he would say, “Just do it!,” which means the same thing. As you may remember, I did a 100 day solo retreat last winter. In the first week after the retreat, it seemed like I had contracted attention deficit disorder during the retreat – I would start vacuuming, and then drop it three minutes latter to take up chopping vegetables, only to stop and go send an email. I mentioned this to my neurologist who laughed and said, “Of course! Your brain wants stimulation and now that it no longer has to comply with the form of the retreat, it’s going to get what it wants.” The symptoms went away after about one week. Barry – Thanks for your comment and your illuminating anecdote. In my experience, sustained periods of uninterrupted mindfulness can sometimes produce temporary absent-mindedness when they have ended. Perhaps that phenomenon also has a neurological basis.